The first ESCA Camp ever took place in Diessen, Netherlands, October 18 -22. Campers from eight different European countries stayed all at one facility, they not only trained together, but also attended workshops, and also socialized during their free time. The internationality of the camp was the reason why working together, learning from each other and inspiring each other to grow was even more beneficial than in case of regular softball clinics. This was not just a clinic, this was a five-day non-stop experience. “Both training sessions and workshops were beneficial, but my favorite part? The time in between, when I got to talk to the other coaches and instructors, we had discussions, we shared our experience and stories. That was where I’d taken the most from,” said Felix Schwan, a coach from Germany. The camps are organized by the European Softball Coaches Association (ESCA), that was newly established by the European Softball Federation in 2016. “I am proud and happy that the whole softball Europe is working together on growing the sport. We wish to organize these international camps every year, so everyone who wants to improve themselves gets the chance,” said Gabriel Waage, ESF president. What is a better way to start the first camp of hopefully many more, with a small group? 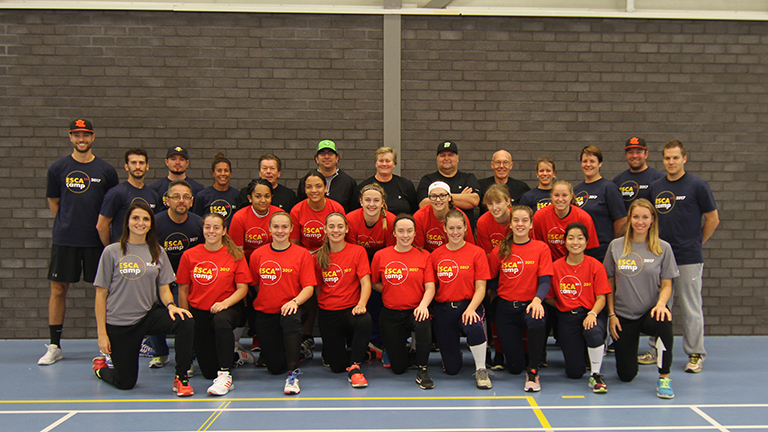 Thirteen players from the Netherlands and England from different clubs worked together as a team to become a better softball player on and off the field. Not only players but also shadow coaches were present from eight different countries. Belgium, Germany, the Netherlands, Italy, Spain, and Switzerland were represented by some of their coaches. The coaches and players learned different and new things from five great instructors – Tracy Bunge (USA), Karen Marr (AUS/lives in NED), Craig Montvidas (USA/lives in NED), Berend Mannessen (NED), Enrico Obletter (ITA) and Vojtech Albrecht (CZE). “I have been at some camps and clinics, but this camp is just different from all of them. It is so much fun and amazing to see coaches and players sharing the same passion: softball. Not only during the clinics, but they just can’t stop talking about it at night, when having lunch or dinner,” said Marjolein Merkx, who volunteered to join the ESCA Camp staff. The camp consisted of training sessions and workshops. “We were able to run the training sessions almost on an individual level with the number of players and coaches we’ve had. Every camper was given a special attention. I believe, it was a great beneficial experience for the campers. For the staff it was also a useful warmup before the second camp,” said ESCA Camp director, Craig Montvidas. During the camp, the participants attended more than 15 workshops covering various topics – how to choose your glove or a bat, scouting your opponent, offensive/defensive strategies, how to communicate with umpires, virtual reality training, and many more. On Sunday, the first-ever ESCA Camp ended, and it was an emotional moment for everyone involved. “Anyone, who has ever planned something new and potentially huge, knows this feeling. We have spent quite some time getting it all ready, making it as professional as possible. When the camp was in progress, I felt like we were doing well. But it wasn’t until the goodbye-part of the camp when we realized we did a great job, the feedback was very positive. We had an awesome group of people here. They became a team over the five days and that was what made the camp so special. Some of the campers even offered their help as a staff for any future camps!” said Helena Novotna, one of the ESCA Camp organizers. The first camp was a success, but the real challenge is right behind the corner. On Wednesday, second ESCA Camp will begin. This time nearly 40 players and 30 coaches are coming to experience the “getting better together”. It will be a challenge to make everything work perfectly at the second camp, but after the first camp, the staff is ready! More instructors from France, Great Britain, and the Netherlands are joining the staff; Britt Vonk – one of the top European players will also come to share her softball experience and knowledge. The second camp is taking place in Diessen, the Netherlands, too. The dates are October 25 – 29. To learn more about the ESCA or the camps follow ESCA Facebook, or the website.